Life is Good for Pinot Lovers Papapietro Perry Pinot Noir C. Donatiello Mr. Pinot’s 30th Vintage Clos Pepe Vineyards: A Window Into Time and Place Valerie’s Vineyard Shandel’s Oppenlander Vineyard Aubin Cellars “Verve” Kastania Vineyards: Pinot to Hoot Over J. Lynne: Pinot Noir with a Soft Touch Paul Lato Wines: So Much with So Little MacMurray Ranch: Pinot Noir with a History ZD Wines: Honoring the Founder Sonoma Coast Vineyards: West County Pinot Noirs Castalia Wines: A Little Known Gem Keefer Ranch: A Russian River Valley Treasure Twomey Cellars Small Sips of More California Pinot Anam Cara Cellars: Celtic Pride in Every Bottle Arterberry Maresh: Dundee Hills Tradition Carried On Evesham Wood: Commendable Pinotosity Scott Paul Wines: Fine Oregon Pinot Noir and Burgundy too! Small Sips of More Oregon Pinot Station Imports: Central Otago Schist-Kissed Pinot Noir More Sips of Pinot from Down Under Recently Released Wine Books Prince of Pinot Impostor! 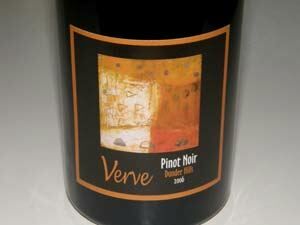 Aubin Cellars is a boutique producer of multiple varieties including Pinot Noir under the “Verve” label. The 2006 Pinot Noirs are sourced from the Russian River Valley, Sonoma Coast and Dundee Hills of Oregon. French-born owner Jérôme Aubin is an importer of oak barrels from Rousseau of Burgundy, St. Martin of Bordeaux, Allary of Cognac, A&K of Missouri and Balazs of Hungary. He also imports wine concrete tanks from Nomblot of Burgundy. The label was founded in 2001. The name “Verve” translates as “crafted with enthusiasm, vigor and integrity.” Verve is also a bilingual French-American noun reflecting Aubin Cellars’ bicultural background. The winemakers are Loren Tayerie (California bottlings) and Ray Walsh, formerly of King Estate and now with his own label, Capitello (Oregon bottlings). The wines have been consistently fine with attractive artwork on the labels and sensible prices. I have reviewed the wines a number of times very favorably. The two wines below are the best I have sampled from this producer to date. For the 2007 vintage, Pinot Noirs will be produced from Stoller Vineyard and Momtazi Vineyard in the Willamette Valley. Four California bottlings will include appellation wines from the Sonoma Coast, Russian River Valley, Monterey and Santa Cruz Mountains. 14.5% alc., 110 cases, $33 ($264 a case). Sourced from Stoller Vineyard. Label artist is Michelle Bonnetain of France. · The nose is quite pleasant featuring aromas of strawberries and red raspberries, a touch of good barnyard and a nice oak spin. Delicious darker red fruit and pomegranate flavors saturate the palate with a sidecar of oak and a touch of brown sugar. Juicy with refreshing acidity, gossamer tannins and a silky mouth feel. Very enjoyable. 14.6% alc., 425 cases, $33. Label art by Gerard Schnieder of France. Yields 2.2 tons per acre average. Clones are Pommard, 777, 828, Beringer and Cruz. Harvested at 27º Brix. 100% de-stemmed. Aged 17 months in 40% new French oak barrels. Unfined and unfiltered. · Bright effusive Bing cherry and strawberry aromas with a hint of cardamon spice and marzipan. Crisp and juicy dark red ripe cherry fruit with a little sassafras, root beer, raisin and spice accents. No rough edges, no discernible tannins. An easy drinking wine that is a bit on the ripe side but quite enjoyable. 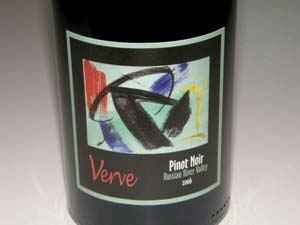 Verve Pinot Noirs are available on the website at www.aubincellars.com. This is a producer with a bright future.